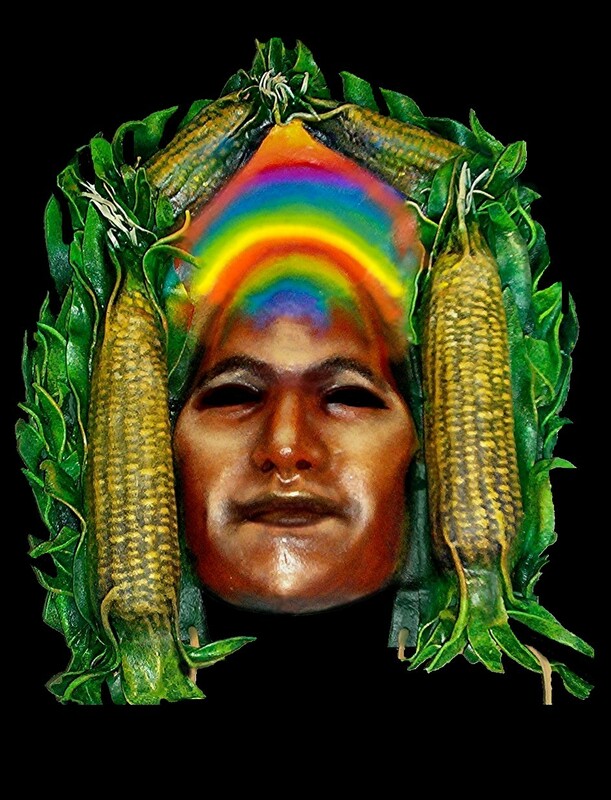 A friend of mine is writing her dissertation on art and shamanism, and wanted to use my story about Corn Mother's Mask. Since I'm now working with my proposal to create a new collection of Masks of the Goddess, I wanted to share again this story, although I know I published it before a few years ago. I think it's a story worth re-telling. I remember a documentary about a famous Hopi potter, who said that she saw patterns and motifs when she went walking in the morning, and they just wouldn't leave her alone until she "wrote" them into her pots. I wondered what it meant to be an artist whose work was attuned to a long tradition of transmission - a purposeful thread woven into the fabric of daily life, not just for one's assertion of individuality, but in service to the tribe, the ancestors, the goddesses and gods..........perhaps not unlike the Icon painters I learned about at Wesley, or the traditional mask makers of Bali, the work is a meditation, a prayer, a devotional activity. 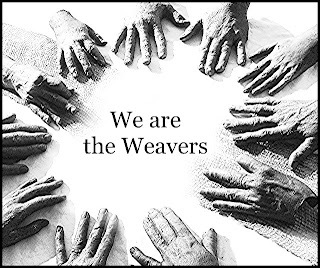 This morning I thought about "the greater collaboration", not just among colleagues, but also with what Bill Moyers called "invisible support", the synchronicities that engage others in the creative process. 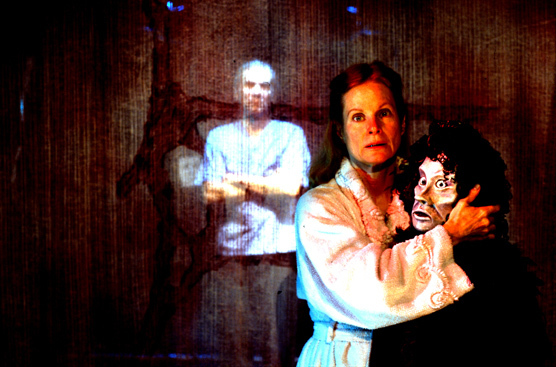 This story happened when I was working with the Masks of the Goddess collection in 2002. "Corn Mother" has many names throughout the Americas - She is the ubiquitious and generous sustainer, the "Demeter" of this continent. 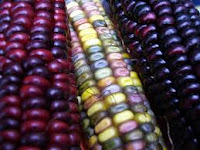 The Cherokee Corn Mother is called Selu, and her story is one of sacrifice and renewal, with compassion for her children, who through fear and ignorance attempt to destroy the very source that sustains them. It is a myth with significance for our time. 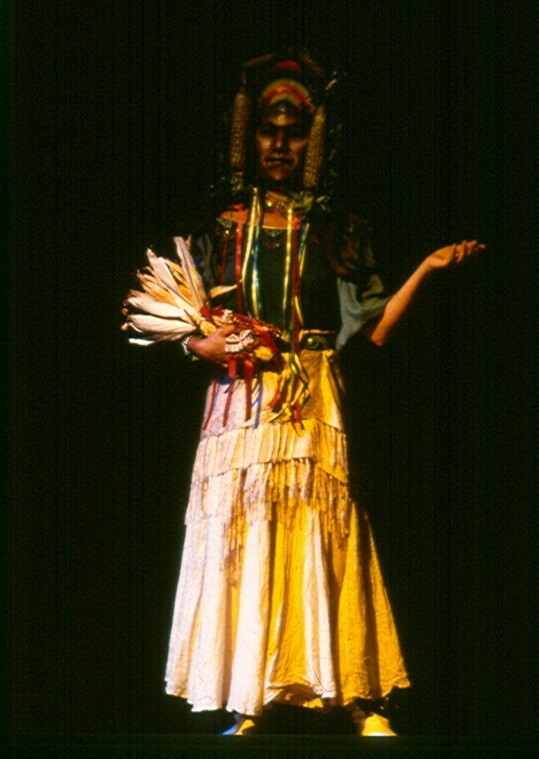 In 2002, I had given the collection of masks to choreographer Mana Youngbear, who was directing a performance in Oakland. I had no idea of what she was creating, but planned to attend the show. About a month before her event, I attended an unrelated event at the University of Creation Spirituality (now the Naropa Institute) in Oakland. Organized by Evelie Posche, and supported by theologian Matthew Fox, the ritual event was dedicated to the Divine Feminine, and included a long and moving meditation about the wounding of the Feminine in Western religions, led by a woman minister. She spoke of the tragedy of the Inquisition, the Burning Times. I sat cross-legged on the floor, surrounded in the darkness by people. Yet when I closed my eyes, I vividly saw something that had nothing to do with the ceremony I was participating in. I saw a Native American woman, wearing a deerskin costume, dancing with an ear of corn in each hand. I opened my eyes - and there were 300 people, most of them weeping. Closed my eyes, and there was the corn dancer. 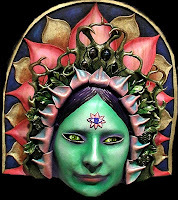 This continued throughout the meditation, and was so strange and vivid to me that I decided to make a mask about her. I placed ears of corn on each side of the face, and as I worked, it occurred to me to paint a rainbow on the mask's forehead, a hopeful symbol of the "Rainbow Tribe" our world was becoming. *** There's a funny postscript - in the summer of 2010 I went to Willits to visit Mana, who was having a big yard sale with Christy. As I walked up to visit, Christy was behind her table selling a tray to someone that was decorated throughout with a corn motif. I guess that's the weaving of our connection to each other! Here I go! I have yet actually post my Project to my lists, and I already have been blessed with 3 backers! I have a feeling this will happen for me, and Macha, and for the masks as yet unmade! What I wanted to share is a funny synchronicity that happened yesterday I can't help but feel is most encouraging. I was frustrated with all the online paperwork involved in setting it up, so I walked to the corner cafe for a bagel. While waiting, I grabbed a magazine, and had to laugh when I looked at the cover! For me it kind of said it all - including an article about "many masks", and, on a personal note, something about Nebraska as well (I wrote an article about spirit contact and synchronicity I called "Angels in Nebraska" in 2005). I like to think, no, I am certain, that the Goddess has quite a sense of humor. Here's something similar (photo below) that happened to me as I stopped to visit the Roman Baths en route to the Goddess Conference in England last summer. "Around the world 'spirits of place' have revealed themselves to us, encounters that generated stories told over the ages. 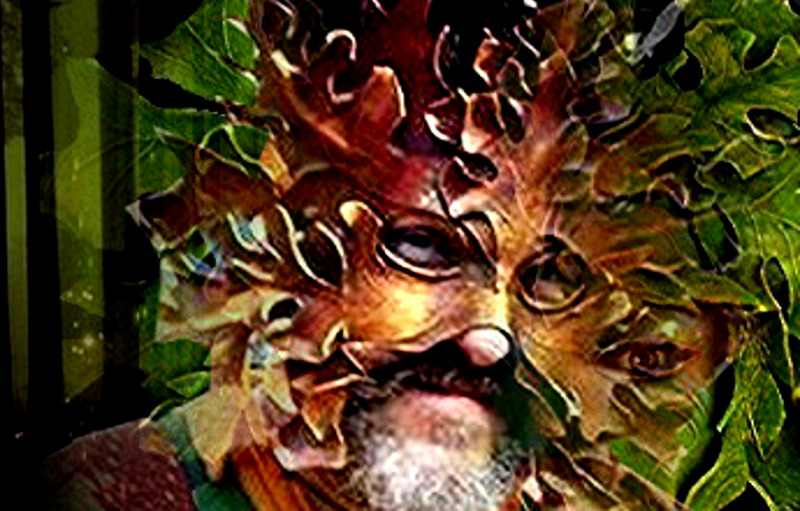 With masks especially created for this event, we propose a ritual performance that offers all celebrants encounters with these goddesses as they have been known in the past, and as they exist today." The day before I went into surgery in November, I received an email from Prema Dasara, who wanted to knowif I was still interested in creating the 21 masks of Tara we had discussed in previous years - they were to be made in Bali, a collaboration with Balinese artists. I felt very much encouraged by this synchronicity (I often pray to Tara for healing), and said (to Prema and to Tara) that I would be most glad to do it if the results of my surgery were positive. And so they were! But Prema has had to cancel the project for this year. 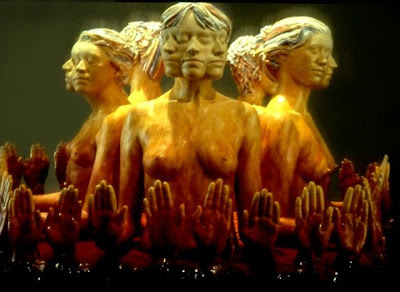 I reflected on how many women have requested the use of the "Masks of the Goddess" Collection, which was sold at a benefit auction for the Independent Eye's production of The Descent of Inanna in 2008 (I'll write about this powerful play in the future). So I decided, since Prema's project fell through, that I would make a new collection of 21 masks of Goddesses, which I would hold in trust for all those who wish to use them in the future. To get the funding I'd need to buy the time and materials to make the masks a friend suggested I use Kickstarter. 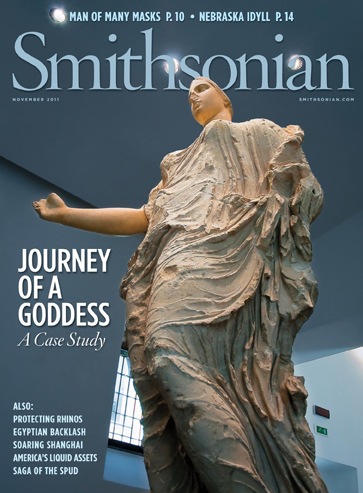 "Ritual studies scholar Ronald Grimes suggests that relearning of ritual ways can help us re-attune to the environment at a time when the ability of our Earth to sustain our lives is imperiled. “The surge of popular interest in the ecological possibilities of ritual is fed by a rich, publicly consumed ethnographic literature, some of which depicts rites as a primary means of being attuned to the environment.” Artists, ecological restorationists, and composers are exploring the use of ritual to enhance our understanding of our interdependence and our responsibilities as a species to attend to maintaining of a healthy Web of Life. Around the world natural phenomena and spirits of place have revealed themselves to us in anthropomorphic forms. These encounters generated stories that were told over the ages. 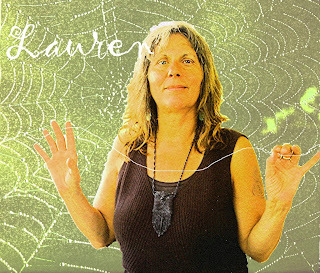 Employing the use of sacred masks especially created for this event by Lauren Raine, using rhythm and chant, narrative and movement, and current scientific knowledge (physics, geology, biology, ecology, climatology, et al. ), we propose a ritual performance that offers all celebrants encounters with these goddesses, as they have been known in the past and as they exist today." 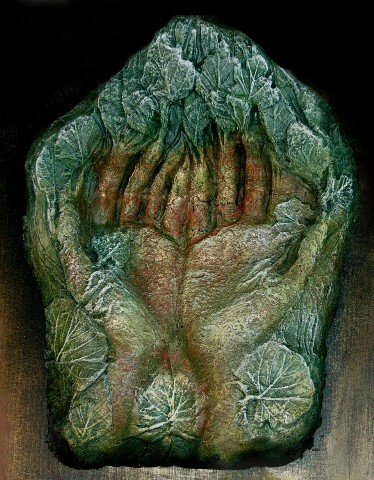 She invites story/voice and ideas from others in the evolution of this piece. I touch the violet amethyst pendant I found in an apple tree in Glastonbury, which I wear around my neck feeling very much that it was a gift from the Lady of Avalon, and try to imagine how I might tell that story..........and what voice the Desert Goddess might have as well.............Well. 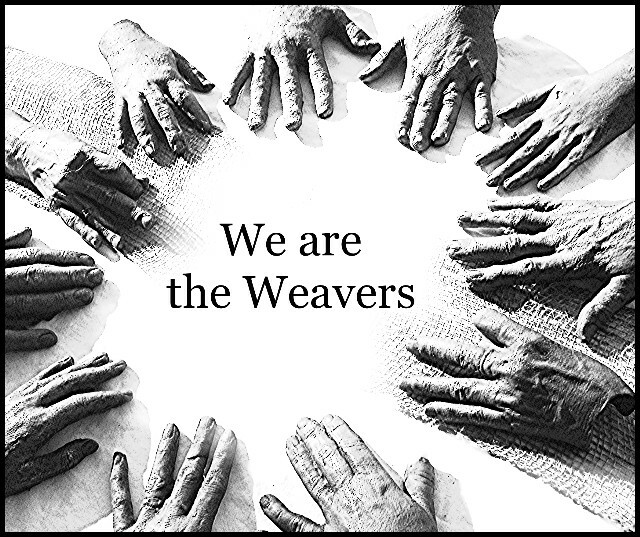 Time to take the plunge, pull out the threads and start weaving, re-weaving, and spinning. 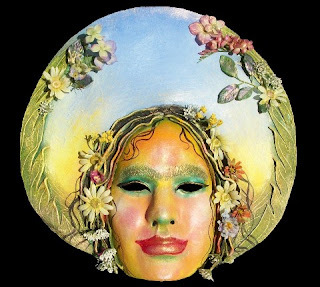 I'll begin my journey with the only Goddess mask I still have, Flora, the Roman Goddess of flowers, and originator of May Day celebrations (at least in Rome). Florence is also my mother's name, and Flora was the name of my great grandmother. The mask spent the past 6 months with a woman who lost her son, and wanted the mask for healing. I'm sure she has infused the mask with the beginnings of story..........Flowers are a good place to begin, they represent beauty, and the invitation to new life. Fertility it is, insemination, all that. As far as that dream goes.......at 62, I'm way beyond May Queen. Sometimes I feel more akin to Miss Marple. But Symbolic it is. "We seem to be having a crisis of honor............Lying and deceit dominate public politics and public life, business, academics, and even the arts. As a result our children have virtually no valid role models on which to model their own sense of honor." "Gingrich’s achilles’ heel is his legacy of three wives and the sordid way he left the first two. He was in the midst of an extra-marital affair with future wife three when he was leading the attack on President Clinton for his affair with M.L. This past week, wife two in a tell-all interview with ABC exposed Newt’s request for an open marriage while he was acting outraged about Clinton’s tryst." I well remember the viciousness of that attack on Clinton, led by Gingrich, which among other things cost tax payers some 40 million dollars as conservatives tried to impeach the President for his affair with Monica Lewinsky. I can't help but equate Gingrich with the loss of honor in government, because he has consistently shown himself hypocritical as well as mean spirited. Medical intuitive Carolyn Myss is one of the new paradigm's most articulate healers. She has commented that we are becoming a culture without honor, which she likens to spiritual "back bone", what we need to support us, to hold us up. Without a personal and social sense of honor, we are like people without a foundation, without the strength to be sustainable. I'm taking the liberty of copying below from an article Carolyn wrote about honor shortly after the Tsunami struck Japan last year. I think what she has to say is important. And I hope Newt never becomes President. "If someone has water running in their home, they put out a sign so people can come fill up their jugs. I come back to my shack and I find food and water left in my entrance. There has been no looting, no pushing in lines. People leave their front door open. People say, "Oh, this is how it used to be in the old days when everyone helped one another." This small story is touching the hearts of thousands of people. Today on a conference call, someone read this story to an entire group of people, then added, "What an example of love and compassion." She was mistaken. Such actions are not just motivated by love and compassion. The absence of looting is not the result of love and compassion. Nor is the choice to stand in line patiently, waiting your turn. This is the result of having a deeply rooted sense of honor. The choice to not steal from a person who has already lost nearly everything in a catastrophe comes from realizing that such an act is the ultimate dishonorable choice. The Japanese come from a society rooted in a long running code of honor, of not losing face. Nothing would be more dishonorable to a Japanese person than to steal from another person who has lost home, business, or family, much less much of the nation they share. An honor code is power - period. And we are witnessing that power holding the social fabric of Japan together. In schools in the United States, words such as "morality" and "ethics", much less "honor" are practically banned. Fundamentalists and other such lunatic extremists consider those subjects "religious". The result of listening to what in fact are the politics of these people has been, ironically, morally devastating to the generations that have since followed the ruling that banned the use of these words or courses involving discussions of that subject matter. Who now can speak about the importance of refining a personal honor code or the importance of studying ethics or learning how to navigate one's way through a moral crisis? The lack of instruction of such essential soul knowledge is now evident in that we rely upon law suits to fill in the absence of honor. We just assume the lack of honor in another person, considering it foolish to do business without a contract or a lawyer. Even if we know them, when it comes to business - well, you just can't be sure honor stretches into that area of a person's character. Right? I mean, come on. Why? Because the other person might just lack a sense of honor - you just can't be sure these days. Why take a chance?Never mind refining our personal sense of honor. We would rather have our sights locked onto to the other person's lack of honor and that's that. The truth is we have become an obsessively litigious society precisely because we are no longer an honorable one. Or, as Benjamin Franklin would say, we are people without virtue. Trusting another, doing business with a handshake, honoring one's word - why, that's just considered old world. Who keeps their word these days? We don't respect this entire spiritual wisdom to either demand it be taught in our schools - and NOT as a religious topic but as a HUMAN ESSENTIAL - or to insure that such sacred knowledge is passed within the home. The handing down of a personal honor code is not a weekend course. It is taught through the example of an elder, a parent. Children inherently look for that instruction. They have a yearning to be schooled in honor because it requires something of them. It demands that they rise up to a certain standard of self-respect and from this standard, self-esteem awakens. ......The people of New Orleans were told that the levees would hold back the water. As a result the much needed funds to repair them were denied. Structural engineers warned authorities that the walls were in desperate need of repair but would we consider our politicians honorable individuals? Do we really believe they are even capable of telling the truth? We now assume we are lied to in this country far more than we assume we are spoken to with respect, which is to say, told the truth. We are treated with dishonor and we accept it as normal. How incredible is that? Is it any wonder then that the Earth is so dishonored or nature or that endless policy decisions are made that lack any sense of honor or evidence of human dignity? Living an honorable life comes at a cost. You have to be willing to stand for something, for values that mean something to people other than yourself. Your values have to make a difference in the world. They have to count, especially in a crisis or when the outcome of your choices - your word - matters to the lives of others. Dishonorable people could care less about whether safety standards are actually met in nuclear plants or coal mines or in air traffic control towers. Their interest is the corporate bottom line - profits. Never mind if the "losses" are human beings. But the power of honorable people committed to making a difference in the world actually have the power to make a difference. Consider that one paragraph from the woman from Sendai, writing about how the people of Japan are sharing everything in this time of crisis. Her words are piercing the hearts of thousands because they are true. They make each of us want to share, to keep our doors open, to be gracious, generous - to be honorable down to our souls. That's the power of one person. I look at the people of Japan with prayers in my heart and gratitude for the example of an extraordinary people who have entered into the beginning of their dark night. I know ours is coming. I pray we learn from their example. I'm delighted to have been given a residency at the Temple of Sekhmet in Nevada (not far from Las Vegas) on the 17th to 26th of April. 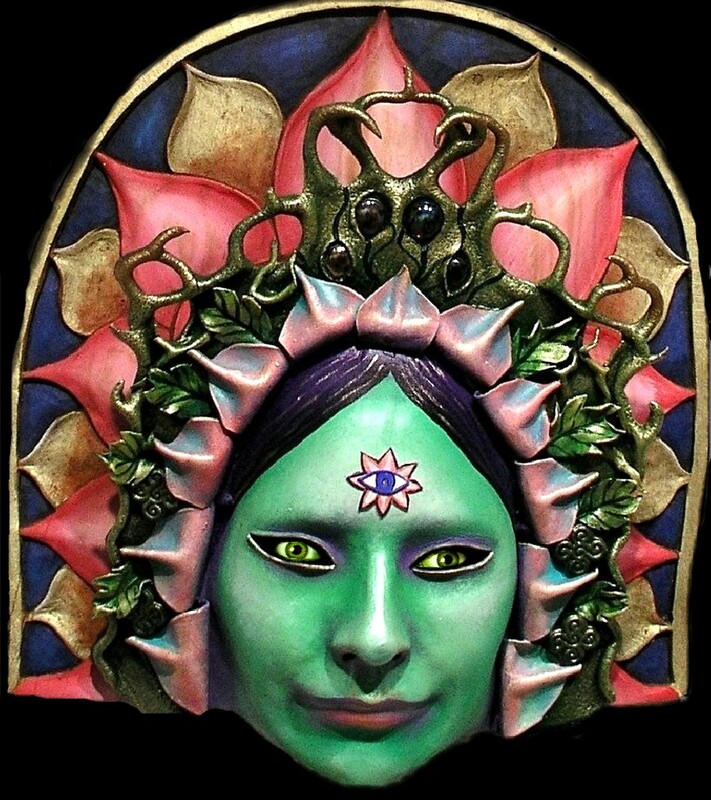 I'll be teaching a Masks of the Goddess mask making weekend workshop there for women. (I love especially doing workshops where the participants can stay overnight, and "incubate" the work together). Looking forward to meeting the people at the Temple, which is also a major center for Peace Activism, and meeting the Goddess of the Desert. S968 and HR3261 are threatening CL and the rest of your Internet. 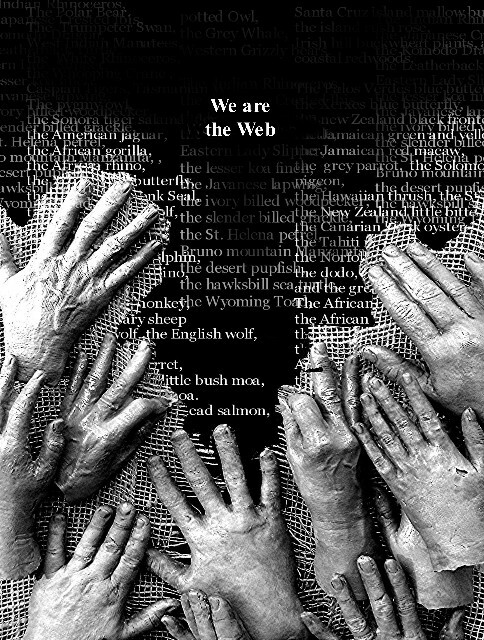 Most of the web sites you use strongly oppose these bills. 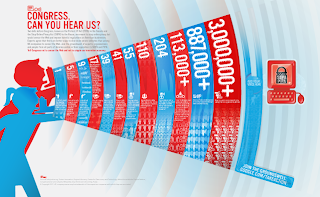 Find out why, and how you can help put a stop to this madness before it's too late! Corporate supporters of Senate 968 (PIPA) and HR 3261 (SOPA) demand the ability to take down any web site (including craigslist, Wikipedia, or Google) that hurts their profits -- without prior judicial oversight or due process -- in the name of combating "online piracy." PIPA and SOPA authors and supporters insist they'd only go after foreign piracy sites, but Internet Engineers understand this is an attempt to impose "Big Brother" controls on our Internet, complete with DNS hijacking and censoring search results. Incredibly, many Congress Members favor this idea. Where does your Member of Congress stand on PIPA and SOPA? PIPA and SOPA Are Too Dangerous To Revise.....they Must Be Killed Entirely . Congress needs to hear from you, or these dangerous bills will pass - they have tremendous lobbying dollars behind them, from corporations experts say are attempting to prop up outdated, anti-consumer business models at the expense of the very fabric of the Internet -- recklessly unleashing a tsunami of take-down notices and litigation. Don't believe it? Monster Cable has labeled craigslist a "rogue site," earmarked for blacklisting and full-takedown under PIPA . As Bill Moyers has famously pointed out (you can see him speaking about Media and Democracy on Link TV at: http://www.linktv.org/programs/special_moyers) democracy is not possible without freedom of information and speech. Below is an excerpt from his 2007 speech on media and propaganda. There's a Temple dedicated to the Egyptian Lioness Goddess Sekhmet in the Nevada desert.........a wonderful place that offers retreat and ritual. The Temple of Sekhmet was built in 1993, and continues to thrive. 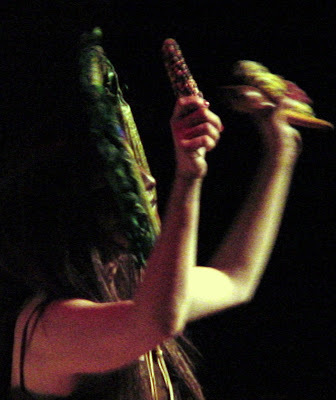 Candace Ross is the resident Priestess, since 2007. 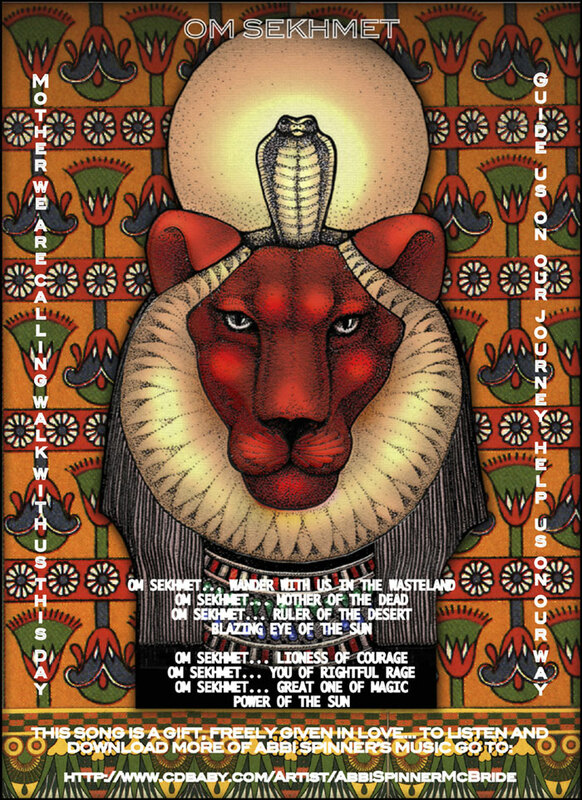 'This is an Informational/Devotional site concerning what the ancient Egyptian lion-headed Goddess Sekhmet–as the Goddesss of Synchronicity–is doing during THIS Space/Time." The Goddess of synchronicity............hmm........I hope to learn more about this Goddess and her temple in the desert! "At the end of his life, the great Indian mystic Aurobindo said, “If there is to be a future, it will wear the crown of feminine design.” Unless we awaken to the mystery of the sacred feminine, and allow it to glow into, irradiate, illumine and penetrate every area of our activity, we will die out and take nature, or a large part of it, with us. 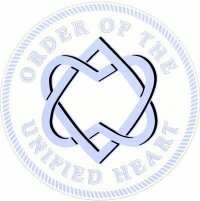 Unless we come to know what the sacred feminine really is — its subtlety and flexibility, but also its extraordinarily ruthless, radical power of dissolving all structures and dogmas, all prisons in which we have sought so passionately to imprison ourselves — we will be taken in by patriarchal projections of it. The Divine Mother, the fullness of the revolution that she is preparing, will be lost to us. We must understand that comprehending the sacred feminine is a crucial part of surviving the next terrible stage of humanity." I'm preparing to work on a new series of Masks of the Goddess, and will do some fundraising for the time and materials I'll need to finish the project this year, and I also just proposed a paper for the conference held by the Association for the Study of Women and Mythology. I've been thinking about this for a while, and have had so many requests for the masks, that I feel it's time to make another collection, and hold them in trust for any who may wish to use them to explore and tell these important, worldwide stories. Whew........big project, but it's time. And because I conceive of the masks as not just for theatre, but as tools for invocation, for changing consciousness, I need to do some serious preparation internally before I can begin the process. There's a kind of collaboration going on here, a clearing out and inviting in. As a student of mythology, I'm not sure it's possible to separate theology from mythology, or sometimes to separate mythology from "magic", which Starhawk defined as "the art of changing consciousness at will". We conceive of what is sacred, or not, through symbol systems, the play of the archetypal powers in the country of myth. 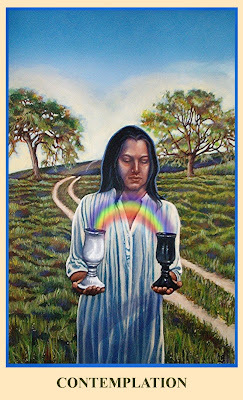 The sacred speaks to us continually, but is translated through story and image. We personify ideas, personalize the Divine in order to experience the Divine......our artwork, our meditations, our prayers, activate the gods. And as we experience them, they experience us. I know this sounds strange, but I don't know how to express it. As Jung wrote, the archetypes have their own collective lives within the collective consciousness of humanity. There is reciprocity. So, as we in-voke the Goddess, She joins with us to shape and change us. I agree with Andrew Harvey , whose mysticism I greatly admire, that now is the time when the Dark Goddess is needed, the one who reveals the shadow that illuminates the light. So much of my own empowerment in the past few years have been "shadow work", the often painful process of uncovering what is below the surface. One thing important to remember about the Black Madonna, for me, is that She is pregnant. She is no gentle mother, but she does carry within the new birth, the child of the future, the embryo. Like Kali, She is the one who clears away and reveals, in no easy way, that which must leave in order for this birth, this new generation, to come into the world. So I think that will be the first mask I make. Theologian Andrew Harvey has written passionately about in the sacred feminine. the Dark Goddess, in this crucial evolutionary time, which is now 2012. "There's another kind of crucifixion going on (today): crucifixion of purpose and hope. Everybody is totally bewildered. They know that the world is potentially on the brink of apocalypse. There's a tremendous danger that as people wake up to the horror of what is going on, they will run into political extremism or into fundamentalism of one kind or another. patriarchal mind and gave him access to a much deeper elaboration of Oneness with all things. He said, "It's a very strange thing, but when I thought of surrendering to the Mother I of course thought of Mary--I often say the 'Hail Mary'--but it was Mary as the Black Madonna that came into my mind. She is the mother of the earth as well as heaven, of the body as well as the soul, the mother of the subconscious, the hidden, of all those powers that the 'masculine' mind represses; the Mother of the sacred darkness. In Her the Western Christian vision of the Divine Mother and the Eastern one merge and meet; you can think of her as both Mary and Kali, both preserver and destroyer. From that time on, I have turned to Her again and again. That's enough to cause me to pause as I reach for that 4th chocolate chip cookie. "There is, I believe, in every disposition a tendency to some particular evil— a natural defect, which not even the best education can overcome." But the show has me thinking about what virtue and vice actually mean to me. Often without thinking about it, we predicate much of our judgement of others, and ourselves, on externalized and internalized ideas of what are virtues or vices. And virtues and vices vary from culture to culture and individual to individual in their importance or lack thereof. And, unlike the world of Jane Austen, so full of moral certainties which gave a comforting "backbone" to the lives of her characters, our is a time of tremendous confusion. I've been thinking about what my own thoughts on virtue and vice are in these strange times, so forgive me if I ponder them for a little while. Although it's not on the "big list" of Virtue, what I find myself thinking about a great deal is HONOR. And it's diminutive expression, COURTESY. Honor..........The circulation of goods in a local economy is obviously not the same as the massive, impersonal world of Wall Street. Capitalism as we experience it is based on manipulation of others, with little regard, if any, for the moral consequences. In fact, people get advanced degrees in how to manipulate the market and people to buy things they don't really need. When was the last time you saw something for sale for $1.00? $5.00? $10.00? Long ago someone figured out that if something is priced at $1.99, people can be manipulated into buying something because is seems to be $1 and not what it really is, which is one penny short of $2. So absolutely everything has a 99 on the end of it - this dishonesty and lack of respect for those who engage in the exchange of money for goods is written into virtually every mercantile exchange we make. It's worth thinking about what that means in terms of the notion of honor, and business. Here's something else we take for granted as "the way things are". We have labor unions to protect the workers, to provide fair wages, pensions at retirement. We have laws that protect against child labor, hours that are unfair, and that protect the environment. All the way it should be - but very little is made in the U.S. anymore. Every time you go into Walmart you are participating in a hypocrisy. There's a chance that that tee shirt, or beaded bag, was made in a sweatshop by a 14 year girl working 13 hour days in an environment that spews toxins into the local river with impunity. And we're paying for it big time. I think of how many sad, impoverished, abandoned down towns I've driven through, whether Herkimer, New York, or Beatrice, Nebraska, or Lordsburg, New Mexico......and on the outskirts of each, the Big Box stores. If money is the basis for what we value, and how we determine worth, then honor falls by the wayside, or moves to the outskirts of town, sucking up the prosperity that should be at the center, and giving little back. * They have an excellent, updated section called "The People's Choice: Nominate a New Deadly Sin". I admire them for their efforts to keep up with the times. Here's an interesting movie that a friend recently passed on information to me about (thanks Joyce!). I haven't seen it fully, so can't really comment about it, but plan on seeing it soon. The author of the movie, Foster Gamble, begins his introduction with the question "What happened? What can account for the staggering deprivation and suffering on this planet?" ..... he has his own conclusions, and conversation, within the movie. 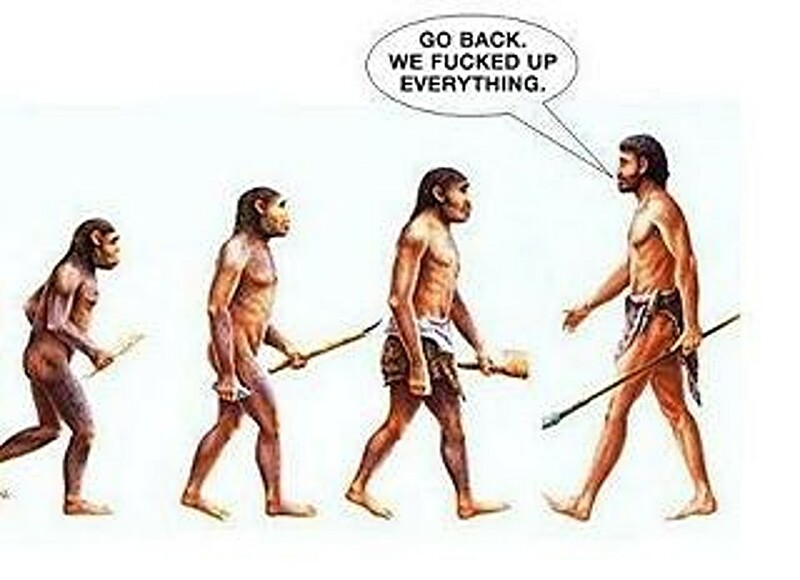 I can't help but add my own comment, which is to say, I do believe the first solution arises from a profound understanding of inter-dependency, that on virtually every level, socially, environmentally, psychically, energetically..........we are all related, and interdependant. From that much can be accomplished. 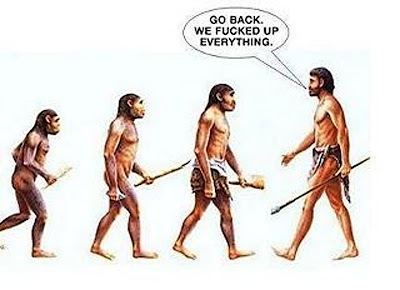 If we can evolve to internalize such a basic truth. 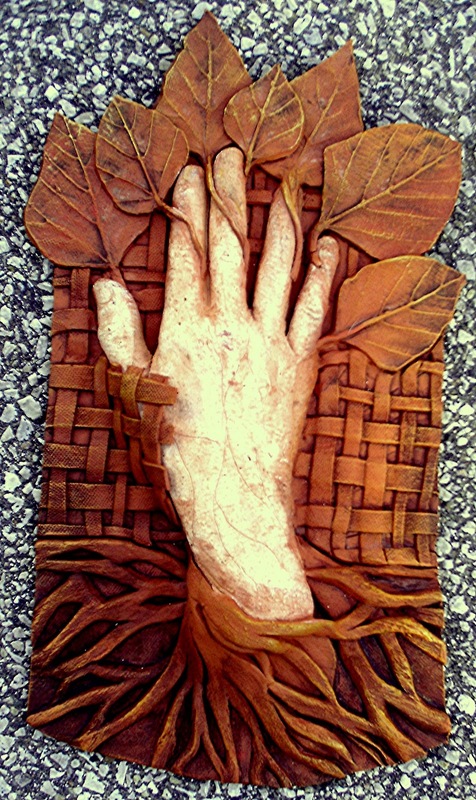 I've been in the studio making hands with roots again........I never seem to get tired of that image. This excerpt from a poem came to mind. Perhaps that's one of the meanings of my obsessive hands - the rootedness of our lives in all other lives, the past and present and future, poised in an open hand. It seems a beginning place for me, an icon I need to begin the new year with, to help me remember that we live in a relational world, a "Conversation".